The MB-C10 combination mounting and pre-construction bracket combines with the C-10SW Presence 10" In-Ceiling Subwoofer (sold separately). 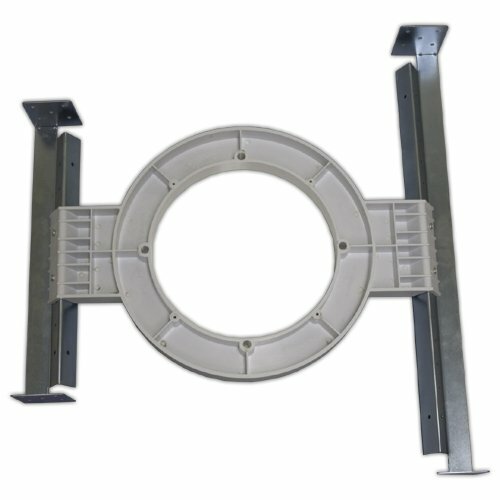 The Bracket and In-Ceiling Subwoofer system has been designed to mount directly to 16-inch OC and 24-inch OC wooden frame construction members (ceiling joists and trusses). Installation Details: The integrated system weighs approximately 11 pounds altogether, which is much too heavy to be suspended overhead in sheetrock, especially due to the powerful and potentially damaging excursions from the unit's 10" long-throw woofer. For the sake of safety, the system is designed so the entire assembly is mounted directly to the structure's framing members. It actually reinforces the sheetrock by unitizing the assembly and the structure's framing together. While the subwoofer is primarily intended for new construction installs, it may also be retro-fitted into existing construction after the sheetrock is in place, as long as the opposite side is accessible to the installer. The structural mounting bracket may be installed from above the sheetrock. If you have any questions about this product by OEM SYSTEMS COMPANY, contact us by completing and submitting the form below. If you are looking for a specif part number, please include it with your message.